RRB ALP & Technician Posts Recruitment Exam Results 2019: Result of 2nd Stage CBT for ALP and Technician posts against C.E.N. No. 01/2018 (20/12/2018) RRB Railway Recruitment ALP, Technician Results 2019 Revised Selection List Released, The results of First Stage Computer Based Test (CBT) with the lists of provisionally shortlisted for appearing in 2nd Stage CBT. Railway Recruitment Board has released the RRB ALP & Technician Exam 2018 result on the regional websites. Candidates who have appeared for the examination can check their result, scores and cut offs through the direct links provided in websites. The results are available for RRB Chennai, RRB Bangalore, RRB Kolkata, RRB Ajmer, RRB Secunderabad, RRB Bhopal, RRB Allahabad and few others. RRB ALP & Technician Exam 2018 result for RRB Mumbai, RRB Patna, RRB Ranchi, RRB Chandigarh are yet to be declared. Important instructions for candidates along with direct link to check RRB ALP Result 2018 is provided below. Indian Railways would be hiring about 26,502 assistant loco pilots and technicians through recruitment exercise CEN 01/2018. Railway Recruitment Boards Employment Notification 2018 details. Railway Recruitment Board (RRB) has announced the examination schedule for the first stage examination for Assistant Loco Pilot and Technician posts. Based on the performance in the 1st Stage Computer Based Test (CBT) conducted during the period from 09.08.2018 to 04.09.2018 by Railway Recruitment Boards for the posts of Assistant Loco Pilot and Technicians against CEN 01/2018, candidates bearing the following Roll Numbers have been provisionally shortlisted to appear in the 2nd Stage Computer Based Test (CBT) as per their merit and post preferences. The Roll Numbers are arranged horizontally in ascending order and not in order of merit..
Revised result of 1st Stage CBT for ALP and Technician posts against C.E.N. No. 01/2018 (20/12/2018) RRB Railway Recruitment ALP, Technician Results 2018 Revised Selection List Released, The results of First Stage Computer Based Test (CBT) with the lists of provisionally shortlisted for appearing in 2nd Stage CBT. ALP & Technician CEN-01/2018 Revised list of candidates qualified for 2nd Stage CBT (ALP & Technician) - Check the candidates final score and their QP of 1st Stage CBT. However, Candidates who will qualify the first stage of the recruitment. Revised Selection List for 2nd Phase released. Check the candidates final score and their QP of 1st Stage CBT. Candidates have to notice that as per the RRB official notification, The RRB ALP Revised Result 2018 of CBT 1 and also the list of candidates shortlisted for RRB ALP CBT 2 will be released zone wise on the official portal of different railway recruitment boards for their respective zones on 20 December 2018. so candidates have to check their results by clicking on the link of their zone to know their result. CBT. The community wise qualifying marks :- UR: 40, OBC-NCL: 30, SC: 30, ST: 25 (Please refer Para 13.1 of CEN 01/2018 in this regard). For PWD candidates the qualifying mark is relaxed by 2 marks from their respective community qualifying marks. Candidates are advised to regularly visit RRB’s official website for the updates. The Roll Numbers of the provisionally qualified candidates for 2nd stage CBT are arranged horizontally in ascending order and not in order of merit. Railway Recruitment Board ALP, Technician posts (26502) Recruitment 2018. Railway Recruitment Board, RRB has released the official notification for the recruitment of Assistant Loco Pilot and Technicians in Indian Railways. The notification as released on March 3, 2018, on the official website of all regional RRBs. Interested candidates checked the detailed notification, important dates, eligibility and vacancy table on the link provided below. Summary of the vacancy is also provided. along with the Final Key for the questions. This facility will be available up to 11.12.2018.
letter will be available for download four days prior to examination date. CEN-01/2018 - Click here for Objection Tracker for the candidates appeared in 1st Stage CBT (ALP & Technicians). This link shall be live for 05 days from 14th to 18th September 2018. 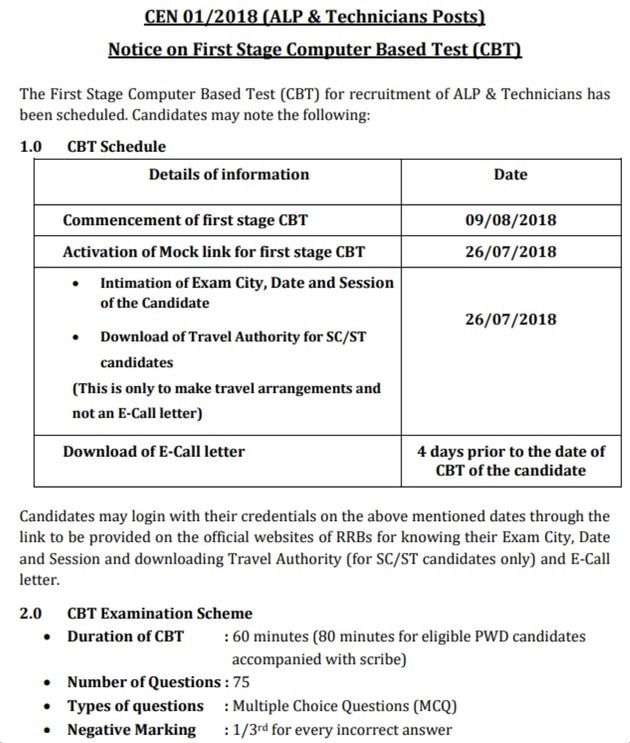 Latest Updates: - The Railway Recruitment Board has released the exam dates for 1st Stage Computer Based Test (CBT) of ALP and Technician. The 1st Stage Computer Based Test (CBT) will be held from 9th August and the admitcards available now. Exam City & Date, SC/ST Pass, Mock Test has been released. The exam will be a computer-based test (CBT) and the link for the mock test will be activated on July 26, 2018. Forgot registration ID / password: If you have forgotten or not received registration details, get them here. If you are downloading RRB ALP Admit Card 2018 for first stage CBT, then you can visit any of the RRB websites. Direct links for official RRB websites are given at the end of this page. Once you reach the website of RRB, you will see link to download admit card (only if admit card has been released). Click it. Now enter registration ID and password along with security code. As soon as you log in, you can see admit card on the screen. Download it. Then print it on a plain white sheet of paper. Indian Railways has declared the exam dates for Assistant Loco Pilot and Technician recruitment. Respective railway recruitment boards (RRBs) will release the admit cards next week. The first stage of the computer based test (CBT) will begin on August 9, 2018 for the posts advertised under CEN 01/ 2018. The mock link for the CBT will be available tomorrow (July 26, 2018). The RRBs will also intimate candidates about exam details like city, date and session on July 26. Registered candidates can find the details online. Indian Railways Announces Exam Date For ALP, Technician Posts. On the basis of marks obtained in first stage CBT, candidates will be shortlisted for second stage CBT. Number of candidates that will be qualified will be a total of 15 times the number of vacancies which is 397530. Qualified candidates will get RRB ALP Admit Card 2018 for Second Stage CBT. RRB ALP Admit Card 2018 for Second Stage CBT will only be available on respective RRB website. Candidates should therefore first visit respective RRB websites to check result of RRB ALP 2018, and then visit same website to download RRB ALP Admit Card 2018 for Second Stage CBT.